Good work as always Mr. Yarbrough. 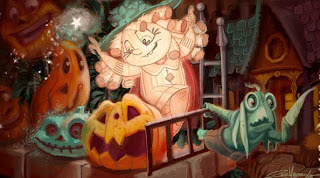 Is that a pumpkin carver I see in the foreground?! Have fun at Comic Con! I love your use of color here, Zane! Especially on the house in the background. And I love your pumpkin carver design. I think that's one of my favorite designs you've done. I love it, so beautiful. Brilliant colors, have fun at comic con. Hope you had a blast at Comic Con! :) I love the colors on this image, and the characters are adorable.